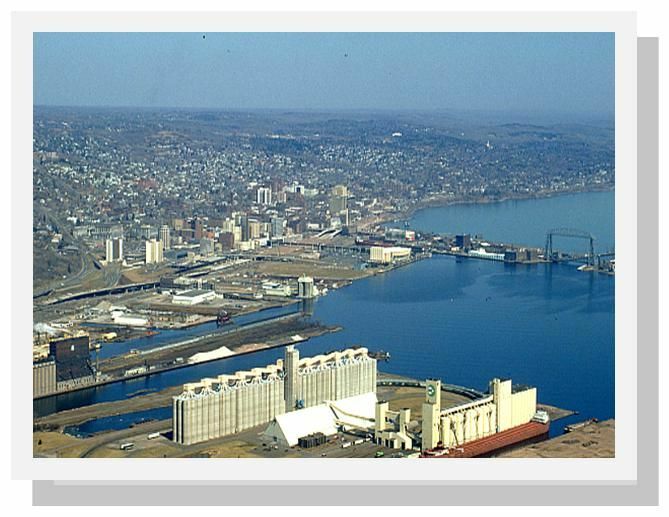 The HTAC is a working group for addressing challenges and opportunities in the Duluth-Superior harbor, while promoting the port’s economic and environmental importance to both communities. 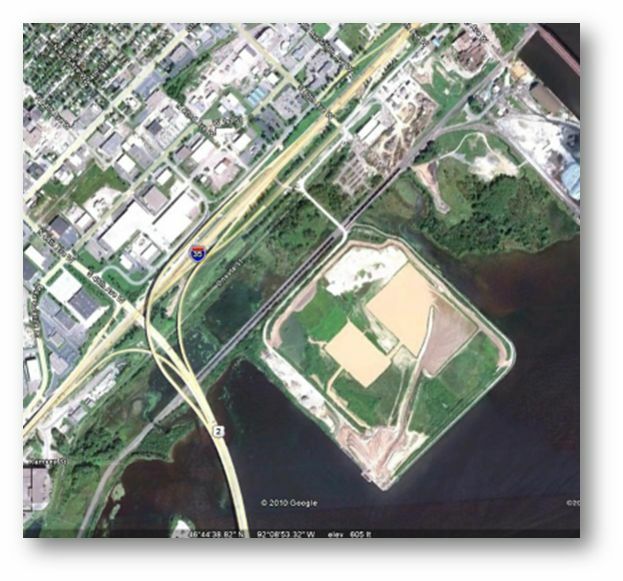 It is one of three advisory committees to the Metropolitan Interstate Council (MIC), the federally designated Metropolitan Planning Organization (MPO) for the Duluth-Superior urbanized area. And it is unique–the only stakeholder group of its kind in the country. Port-centered issues are usually complex, often controversial and sometimes downright contentious: dredged material management; marine safety; port security; land and recreational uses; economic development proposals; accelerated corrosion of maritime infrastructure; ballast water and invasive species management; legacy environmental degradation and habitat restoration initiatives –to name a few. None of these problems affects one group alone, and none can be addressed except through the coordinated action of many diverse organizations and individuals. The HTAC has emerged as a national model for doing just that, through planning, collaboration, information sharing and long-term institutional involvement. Its diverse members all hold a stake in the continued success and health of the harbor. Participation on the HTAC encourages representatives from industry, government, academic, environmental, regulatory and citizen groups on both sides of the bridge to recognize that although they have distinct missions they also have shared goals. HTAC members, in other words, are genuine stakeholders who have, over its 20-year history, learned the value of playing nice and working hard together. One recent example of the HTAC’s successful, collaborative planning process is what’s happening at Erie Pier. It might seem a little hard to get excited about this “hidden in plain sight” facility on the Duluth waterfront—but it represents an entirely new paradigm for dredge material handling. Thanks to the efforts of many HTAC members who undertook an intensive multi-year planning process, and to the US Army Corps of Engineers which subsequently agreed to make a significant investment in redesigning and re-engineering the facility, a major physical restructuring of the full-to-capacity Contained Disposal Facility at Erie Pier was undertaken to convert it to a Recycle-Reuse Facility. It utilizes hydraulic sorting to separate out the clean, uncontaminated sand and silt that’s dredged from the shipping channels for reuse in large-scale projects such as road construction and landfill cover. The Duluth Seaway Port Authority now manages Erie Pier dredge materials as a valuable, re-usable resource instead of a waste product. By creating a cost effective and environmentally sound alternative to standard dredge material disposal practices, it will save local taxpayers the millions of dollars it would have cost to develop a new CDF. It also has the potential to change the way other Great Lakes ports manage their dredging operations. 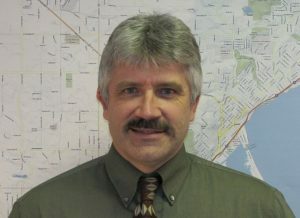 Erie Pier has recently gained the attention of the Canadian federal government, which is looking at the Erie Pier facility as a model for a new hydraulic sorting procedure at one or more of their dredging sites. Most port communities face similar challenges. For this reason, we’ve been invited to present the HTAC model at many national-level planning and port conferences in recent years. You can follow or participate in this notable initiative that’s happening right here in Duluth-Superior. For more information or to get on our meeting mailing list, check out the HTAC page on the MIC website at dsmic.org/htac. Writing credit: Andy McDonald contributed to this article. Transformative changes are taking place in the Lincoln Park neighborhood. A major redevelopment of the old Clyde Iron industrial complex was just completed. A new Western middle school is rising on the hillside. A segment of the Cross-City trail will be winding through this neighborhood in the next few years as it spans the city from east to west along the waterfront. Here at the MIC, we see these exciting new community-oriented developments and start to think about…access, connectivity and land use. We’re kind of geeky that way. Let me explain. Access is about making sure that people, who have different mobility options and who need or want to use these facilities, can get to them easily and safely. Connectivity is about making sure that usable and intuitive transportation links exist between the new developments and other destinations. At the base of this this neighborhood, popular destinations would include Wade Stadium, Wheeler Field and Harrison Park. And along the top of the ridgeline are Skyline Parkway and the Superior Hiking Trail. Complicating the situation, the land uses for these facilities are distinctly at odds with each other. The middle school is located on the edge of a traditional residential neighborhood that is easy to walk through, with square blocks, houses close together and minimal, slow moving traffic. It can actually be characterized as a semi-rural area, with few sidewalks and narrow streets, many of which dead end into large open spaces. The Clyde Iron complex, in contrast, which also houses a Boys and Girls Club, indoor athletic fields, year-round ice rink, and in the future a nearby Duluth Children’s Museum—is located in an established industrial area, where a significant level of pedestrian traffic was not anticipated. 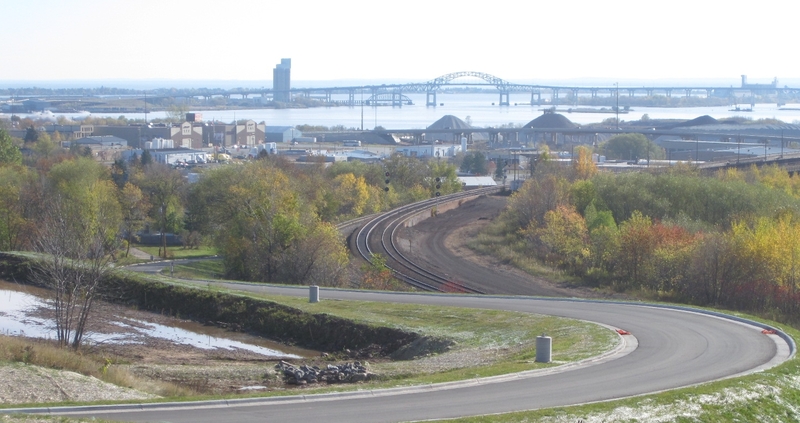 Last but not least is the huge barrier of the railroad tracks that run between the school and the Wheeler Field park space and the Denfeld neighborhood immediately west of the school. So, a number of our current studies are taking a look at how people move around this neighborhood in light of the new developments. Creating a walking corridor between these facilities is a key transportation piece for this neighborhood. The Lincoln Park Pedestrian Corridor Plan is focused on creating a walking route up and down the hill from the middle school to the Clyde Iron complex. An upcoming Safe Routes to School site assessment will further examine the school and walking and bicycling routes to the middle school to the surrounding neighborhoods. And a larger neighborhood wide transportation study, the Lincoln Park Multimodal Transportation Assessment will build off of the other 2 studies and focus on all modes of travel in the neighborhood. Lots of work is ahead. We’ll keep you posted. This exchange reminded me of the simple, real-life benefits of one of our favorite concepts here at the MIC: multi-modal transportation networks. 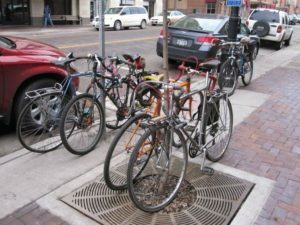 From a transportation planning perspective, a multi-modal transportation network refers to a balance of infrastructure that supports multiple modes of travel — a mix of roads, air, marine/port, rail, public transportation, bicycle and pedestrian facilities (including paved and non-paved trails). This mix is plainly visible on any given day in the Duluth-Superior area. From a societal and governmental perspective, multi-modal transportation networks have been widely supported because a balanced transportation system encourages economic growth, reduces congestion and environmental impacts, and improves mobility and access to transportation. From my personal perspective, though, a multi-modal transportation network means that I have options. It was just too nice of a morning to get in my car and drive (the very walkable distance of) two and a half miles. 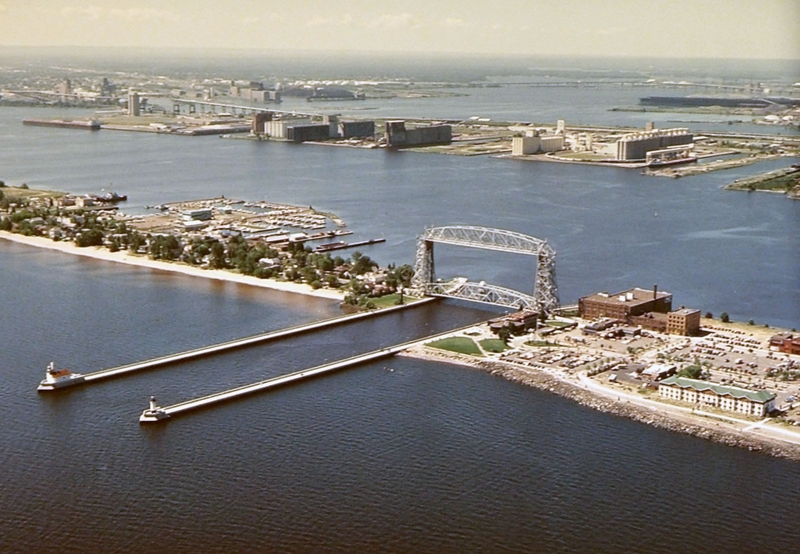 One big advantage of living in Duluth, Minnesota, is the proximity of urban areas to green spaces. A multi-modal system, in this city, means that I can walk out my back door onto the Superior Hiking Trail, which in turn intersects with our urban streets infrastructure across Skyline Parkway (as scenic a walk as you could ask for), down through a couple of local neighborhoods and to our downtown office. And a community-wide vision is emerging for Duluth to become the premier trail city in North America. Developing an inter-connected trails system will provide not just outstanding recreational opportunities but compelling transportation options as well. Bottom line, I don’t have to get in my car and drive every time I need to go somewhere. I’m able to travel on foot (or by bike or by bus), and I consider that a big quality of life enhancement. You Have Feet. Walkable Neighborhoods Encourage You to Use Them. In our previous post about the Lincoln Park Pedestrian Plan, we talk about the goal of making it a “walkable” neighborhood. And you might be asking (with good reason) what does “walkable” or “walkability,” mean, anyway? Walkability is basically “planner-ese” for how easy and safe it is for a pedestrian to move through an area. And now you might ask, so what? When a street is welcoming to walkers, a whole range of benefits to society appear. Be they health, environment, or social—getting people out of their cars and onto their feet does our community good. When everyday travel can be done on foot, people exercise without ever technically “working out.” With fewer cars on the road emitting toxic fumes, the whole community breathes cleaner air. And with more people out in the community chatting with each other, community bonds are strengthened. Why Don’t More People Walk, Then? Walking is, well, not always the easiest option in Duluth. Aside from the fact that the city is located on a giant hillside (some avenues gain as much as 700 ft of elevation), there are other problems. In some places the sidewalk network is obstructed by overgrown vegetation or missing sections. In other places there are roads that pedestrians frequently need to cross but lack crosswalks, signals, or signage at the intersections. Our freezing-cold winters and piles of snow don’t make it any easier, either. The benefits are clear though, and well designed streets to can go a long way toward the city comfortable and safe for people on foot. Personal safety and security is perhaps the greatest concern for most people as they consider walking over driving. Most people won’t walk in settings in which they feel a threat, real or perceived, to their personal well-being. Heavy, speeding traffic and big, wide roads can create an environment that is downright hostile to pedestrians. That is why it is so important to have a pedestrian infrastructure such as a complete, well maintained sidewalk network and crosswalks. An important tool that planners use to understand—and improve—the walkability of a neighborhood is called a walkability audit. This is an actual, physical walk through the neighborhood along a predetermined route. The planners carefully observe the street and evaluate what they see according to a set of criteria (Sidewalks? Crosswalks? Obstructions? Safety hazards?). Once these observations are noted, they are discussed and eventually serve as the basis for recommendations for how to improve walkability of the study area. These recommendations will ultimately be included in the final pedestrian plan, which, like others, will be used by local government and community groups for how public improvements and private developments should be planned for from this point forward. We’ll be conducting a walkability audit for the Lincoln Park Pedestrian Plan later this week. The hope is that if we can determine and encourage the best route up and down the hill, many more kids will be able to walk and bike to school and other popular destinations. Check back soon to see the group’s findings.